Hey friends! 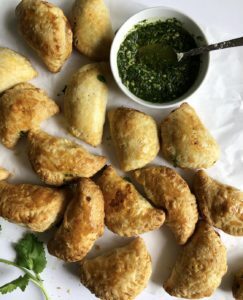 I’m back from my Miami trip which inspired these empanadas. There is such a huge presence of Hispanic culture in the area, especially in the cuisine. 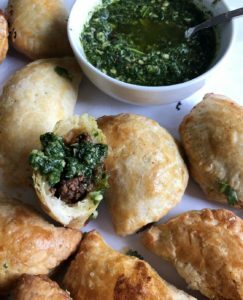 Empanadas have always been a favorite of mine. My mom would actually make fried empanadas stuffed with chicken curry and veggies. 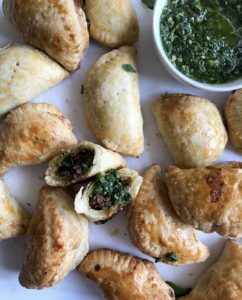 This recipe, however, involves baking and puff pastry which is less traditional but definitely more flaky and simple to do. I guarantee once you try this; you will be making it over and over. It’s just that good! It is the perfect potluck dish or party food; a great accompaniment to a meal and both kids and adults enjoy them. 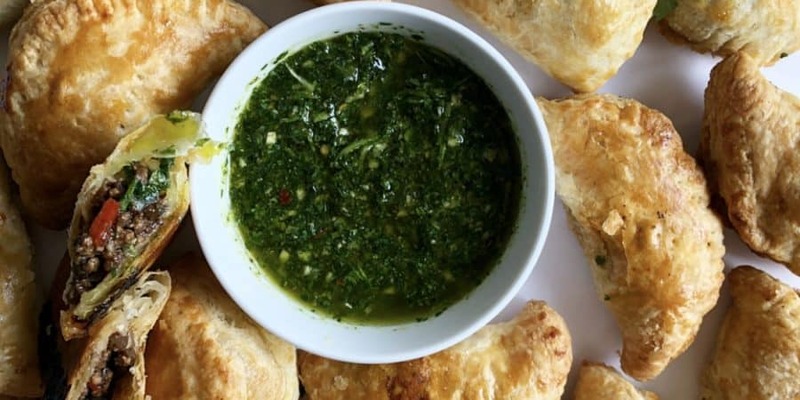 The chimichurri sauce is the perfect dipping sauce as well! In a skillet, heat the olive oil and add in the garlic, pepper, and onion. Sautee for 2 minutes before adding the ground beef. Make sure to break the ground beef into pieces with a wooden spoon; you don’t want chunks of beef. Season this well with salt and pepper and all the other required seasoning above. Add in the tomato sauce and pomegranate molasses as well. Cook for about 7 minutes till no longer brown. Add in the chopped cilantro or parsley and stir. Taste the mixture and adjust seasoning as needed. Preheat oven to 425 F. Set ground beef mixture aside to cool. Line a baking pan with parchment paper and set aside as well. In the meantime, prep the puff pastry. Roll out the room temperature dough on a flat floured surface. Using a bowl or 4-inch circle cutter make the spheres. Add 1 large tbsp of the ground beef mixture to the center. Brush with egg wash along the edges. Seal by folding the dough over to create the shape of a moon. Align the edges then secure by pressing down on the edges as well. Take a fork and pinch around the edges to ensure empanada is closed. Place prepared empanadas on the baking sheet. Poke 2 holes into the empanadas and brush with a little egg wash on top. Bake for about 20 minutes till golden brown. Chimichurri sauce recipe is seen here.